http://www.slccolorado.org/storage/proscar/ Never Say Never. It’s a Justin Bieber song I am very familiar with because I have an eleven year old daughter 🙂 However, it’s also a good principle to live by as the tighter we hold on to something the more likely God will loving pry it away. Our lives should be surrendered and willing to embrace change. Oh how many times have I said, “I will click NEVER…” Usually when I surrender I experience unexpected blessings. Let me share just a few. comprare viagra generico 25 mg a Milano In late 1994 Jon was offered a job out in San Diego, CA and I said, “I would http://cinziamazzamakeup.com/?x=viagra-generico-50-mg-pagamento-online-a-Parma NEVER leave Austin, TX especially to relocate to California.” We’d only been in Texas since 1991 and Jon finally had a job at IBM – something he had dreamed of since graduating from college but now was frustrated by the bigness of a large corporation and the impasse to get ideas implemented. Let me brag on my husband a second. He is really creative and crazy intuitive. Over the course of his career he has been awarded 23 patents. He loves to think outside the box and today he is employed by a company who recognizes his gifting so they created a job just for him. His title is “Innovation Explorer”, whatever that means, and he enjoys what he does. It’s such a blessing for our husbands to have passion for what they do – thank you Jesus. http://cinziamazzamakeup.com/?x=quanto-costa-viagra-generico-25-mg-online-a-Verona We eventually moved to San Diego and we loved it. It was like being on a three year vacation, lots of sun and fun places to explore. God provided us with an incredible house plus the coolest neighbors. I began my home schooling journey out in CA after saying “I would http://cinziamazzamakeup.com/?x=vardenafil-originale-Lombardia NEVER home school.” Yep, and 17 years later, I am stil at it. My two eldest have both graduated from college and are living on their own each doing ministry – one in San Diego, and the other in Detroit. Oh so many blessings were had because I surrendered and trusted God with their education. I’m so grateful I was more focused on pleasing God rather than man as we had so many who were critical of our choice causing me to doubt my abilities. I felt the most resistance by the local church. What I have learned is that when you do anything different from others you may feel judged but do it anyway if God has directed you. I have such a close and precious relationship with my daughters and know that things would be different had I not followed His promptings. http://cinziamazzamakeup.com/?x=viagra-generico-50-mg-miglior-prezzo-pagamento-online-a-Napoli Then there was, “I will http://cinziamazzamakeup.com/?x=levitra-originale-20-mg-dosaggio NEVER have any more children as two is the perfect number.” Yep, when our eldest was 12, her sister was 10, and I was 38 along came Cayley. I can’t imagine life without her. I was meant to be a mother and by the time I fully embraced this my older girls were about to head off to college. Empty nest was put on hold and I was given another opportunity to mother a decade later. Oh there were countless “I will dove acquistare viagra generico 100 mg a Napoli NEVER…” associated with how I parented but like wine I have mellowed with age and some things I once felt strong about I laugh at today. God continues to refine me though parenting and home educating our sweet Cayley. Lastly, when adidas purchased Jon’s company in February 2009 I said, “I will go here NEVER live in Portland, OR.” It’s been a joy to spend the last three summers up in Portland as the weather is a nice break from the sizzling summers in Austin, TX. There were many reasons to not move to Portland but this summer God whispered, “Will you let go?” Jon has an incredible job and while there are so many reasons to stay in Austin I felt God just wanting me to surrender this area of my life. I’m sure it had nothing to do with the sermon last week on surrender and being asked, “What I are you unwilling to let go of?” Or maybe it was our visit with Micheal and Meri Reed on June 22-23, 2012. 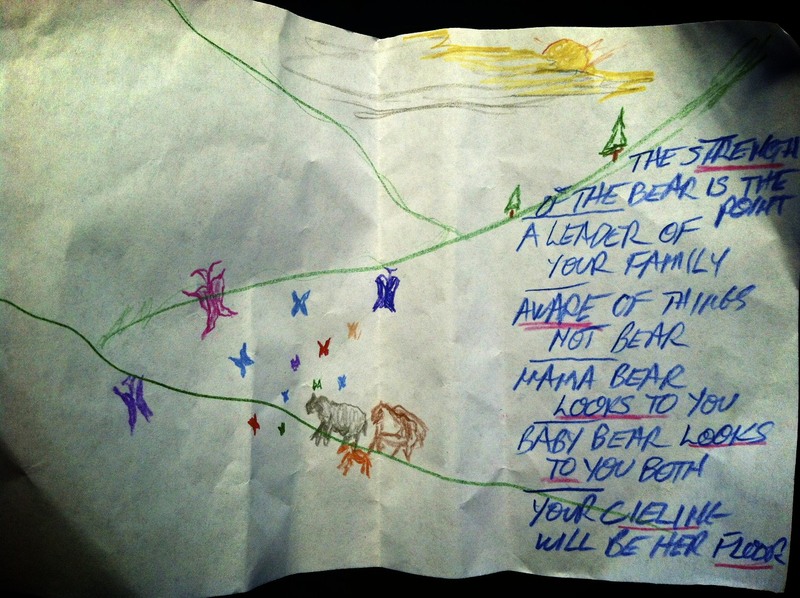 Micheal had been praying for us before we arrived and wanted to shared a vision God had given him in regards to our family represented by 3 bears. The bear symbolizes many things: protection, being free in spirit like the wind, peaceful, discerning, etc.. He said, “I feel you are about to embark on a new journey represented by us climbing the mountain. Jon was keenly aware of the many small things surrounding us. He said, “many go through life and never notice the God details,” represented by butterflies. He shared how before he entering a place he will ask God, “Give me an awareness of your presences.” He has a timer that would go off every hour to remind him to seek the presences of God in all situations. He implored Jon to trust his instincts. I was following Jon as I trusted Jon’s leading us and wanted him to lead. Then there was Cayley looking up to both of us in faith. Prior to meeting with Mr. Reed earlier that day, Jon and I were listing pros and cons of possibly moving during our drive from Portland to Redding, CA. After hearing this vision I felt incredible peace about moving. And if this represented how God was leading Jon I would not want to be sitting together later in life and have him wonder what direction his career could have taken had we moved to be more involved with his team. Thanks for sharing your story of how God brought you along in learning to never say never. Looking back on my own learning experience I have to say, I can laugh at my audaciousness to think I could tell God anything in such absolutes much less my husband! Learning surrender is ongoing all the time. I love this! What a precious story of trusting God in all things! I LOVE the drawing that Mr. Reed did to explain his thoughts for your family! What a blessing to see him before he passed. I am spent after reading this beautiful post of your life with Christ . It is so beautiful and uplifting and filled with LOVE !! I must admit I was one of the skeptic of Homeschooling as I didn’t understand. Now I enjoy the the results!! I love where you are on this Journey and we have been the ones so Blest with our Spiritual, and Beautiful Granddaughters !You and Jon have grown in Christ and this letter is a testament to the Love of your family and God !! You make me so proud !! Thank you for sharing !! I love you.